Beautiful windows that welcome sunlight brighten the personality of your house. While this is what we all envision in our homes, uncontrolled sunlight can be an offender by bringing thermal discomfort and creating visual glare. Cardinal CG Company offers a solution to solar glare and thermal discomfort. LoE²-240 glass provides a great combination of aesthetic appeal along with energy savings and indoor comfort. This cool, spectrally selective coating is applied to clear glass, so that the appearance and performance are the same regardless of glass thickness. LoE²-240 is more than a solar control glass. Its advanced coating design also provides the lowest possible U-factor to deliver comfort and energy savings during cold winter weather. Ordinary clear glass transmits as much as 90% of the solar energy in all the regions and is just ineffective at controlling glare or solar heat gain. 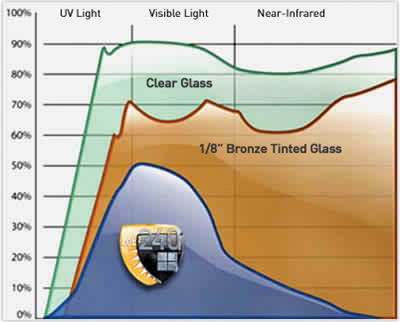 Regular bronze and gray tinted glass absorbs as much as 50% of all sunlight, but is unattractive due to color variations from different glass thicknesses. The same tinted glass receives temperatures that can exceed 100°F, leading to serious discomfort near the window. Ultraviolet (UV) LoE²-240 blocks over 84% of the harmful UV radiation. Visible Light LoE²-240 absorbs 60% of the visible light, which gives the coating glare control and its soft muted blue color. Near Infrared (NIR) LoE²-240 reflects nearly all of the invisible solar infrared rays. LoE²-240 permits visible light to shine while blocking UV and NIR light. LoE²-240 glass allows you to let sunshine come in without bringing discomfort to your home while controlling glare. Its advanced design and great appearance presents flexible options. LoE²-240 – the clear answer to glare control and comfort.